Climate change affects the land, water, people and wildlife of the Neponset Watershed, changing what we view as "normal," and subtly affecting our daily lives. Species must adapt to these changes, migrate elsewhere (often, not feasible), or suffer. We can reduce our contribution to climate change as well as help natural communities to adapt. Vegetated banks, Pine Tree Brook, Milton. As air temperatures rise, stream temperatures follow. Unfortunately, warmer water can’t provide as much oxygen for fish or the small animals that live along the stream-bottom. Thus, fewer animal species live in such an environment, as compared to in a cooler stream. (1) Plant a variety of native plants around any stream or pond in your backyard, and let these plants grow tall enough to shade the water (never mow down to the water’s edge). Tall plants, shrubs and trees will help to keep the water cool enough to provide oxygen for aquatic wildlife. (2) Conserve water. The less water you take from the ground, the more water there will be for streams, ponds and wetlands. The more water there is in these waterbodies, the cooler they can be (and the more oxygen they can hold), since more water takes longer to be warmed by the sun. Climate change causes more intense and frequent storms, increasing flooding and erosion along streams and rivers. (1) Plant a wide strip of diverse native plants around any stream or pond in your backyard. Let these plants grow up (never mow down to the edge of the water). 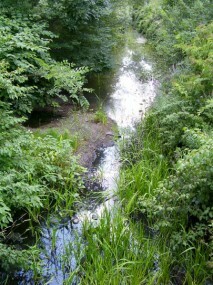 The grown plants will slow down the water that flows over your yard and into the stream. The slower this water moves, the less dirt and contaminants it will carry into the stream. Also, the slower water will not cause as much erosion of the streambank. Slower flow also will allow more water to absorb into the ground to be filtered of pollutants and to recharge the groundwater. (2) You also can protect your stream by building “rain gardens” in your yard to absorb the water that flows from your driveway, the street, and downspouts during rainstorms. (3) Your family even can replace your driveway with permeable pavement or pavers, to allow more water to absorb into the earth instead of running straight into a stream. Expect more droughts. Streams will get very low at times – and even sometimes disappear. Use a faucet aerator to help you conserve water. Conserve water, every day. Reduce the water you use at home, school and work, and help your friends and family to do the same. By using less water, you help more water to stay in underground aquifers, to supply water to streams, wetlands, ponds and the river. Turn off the water when you: brush your teeth, wash dishes by hand, or shave. When your family needs a new appliance (like a dishwasher, toilet, showerhead or washing machine), choose a water-efficient model. If your family waters the lawn, water in the morning to reduce water waste through evaporation. Plant native, drought-tolerant plants in your yard, to water less, in general. Wildlife will look for cooler areas to live. Restored stream and river corridors, where a variety of native plants have been planted along the riverbanks, offer cooler shelters and travel corridors. Volunteer with local projects that ecologically restore stream and river corridors. Get carbon-conscious. The problem of global warming stems from a previous lack of awareness of our carbon footprint and its effect on climate. Individuals and families can start by using one of several publicly available carbon-footprint calculators that will help you understand which choices make the biggest difference. Drive change. For most people, choosing a vehicle (and how much they should drive it) is the single biggest opportunity to slash personal carbon emissions. Each gallon of gas used is responsible for 25 pounds of heat-trapping emissions. Look for the Energy Star label. When it comes time to replace household appliances, look for the Energy Star label on new models (refrigerators, freezers, furnaces, air conditioners, and water heaters use the most energy). Choose clean power. Consumers in Massachusetts can purchase electricity generated from renewable resources that produce no carbon emissions from your local utility. If your local utility does not offer a “green” option, consider purchasing renewable energy certificates. Unplug an underutilized freezer or refrigerator. One of the quickest ways to reduce your global warming impact is to unplug a rarely used refrigerator or freezer. This can lower the typical family’s carbon dioxide emissions nearly 10 percent. Get a home energy audit. Take advantage of the free home energy audits offered by many utilities. Even simple measures (such as installing a programmable thermostat) can each reduce a typical family’s carbon dioxide emissions about 5 percent). Lightbulbs matter. If every US household replaced one incandescent lightbulb with an energy-saving compact fluorescent lightbulb (CFL), we could reduce global warming pollution by more than 90 billion pounds over the life of the bulbs. Buy good wood. When buying wood products, check for labels that indicate the source of the timber. Forests managed in a sustainable way are more likely to store carbon effectively – thus helping to slow global warming. Spread the word, and help others. A growing movement across the country seeks to reduce individual, family, business, and community emissions while inspiring and assisting others to do the same. Let policy makers know you are concerned about global warming. Elected officials and candidates for public office at every level need to hear from citizens. Urge them to support policies and funding choices that will accelerate the shift to a low-emissions future. Fact sheet about what to expect of climate change in Massachusetts, produced by the Union of Concerned Scientists (UCS): Massachusetts: Confronting Climate Change in the U.S. Northeast (based on UCS report Confronting Climate Change in the U.S Northeast: Science, Impacts, and Solutions). Learn more about climate change and what you can do, from the Union of Concerned Scientists.